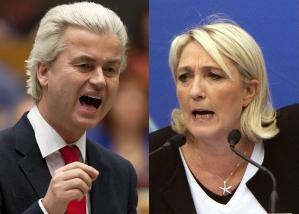 Le Pen is to meet Geert Wilders, her ideological counterpart in the Dutch anti-Islam party, the PVV, as part of a far right campaign to join forces ahead of next year’s European Parliament elections. In order to form an official group within the European Parliament, Wilders and Le Pen are aiming to deliver at least 27 MEPs from seven different countries. Both parties currently lead in polls in their respective countries. The continuing advance of the far right across a continent which only this week commemorated the horrors committed by Nazi Germany in WWII should be a matter of grave concern for all EU member states. IHRC believes that the far-right can only flourish in an an environment conducive to xenophobia of the kind that has been created in European mainstream society in recent years. Our extensive research into hate crimes aginst Muslims in Europe and the US is crystallised into the Dominant Hate Model of Intercultural Relations which states that for far right ideas to take root and gain traction requires mainstream society to systematically “otherise” communities on the basis of race, religion, gender etc. through the media, legislation and enforcement, and popular culture.